How River Way Ranch Camp has successfully developed a diverse and well-rounded slate of camp and conference offerings. In its 39 years of operation River Way has gone through various phases and has offered, and still offers, a number of unique programs. Through those years, River Way has used its experience with its experiments as an effective foundation to develop a strikingly successful summer camp, including program opportunities for special groups. For example, River Way has hosted a camp session in conjunction with the California Burn Foundation for burn survivors and firefighters for 21 years. This specialty camp, which runs separately from River Way's traditional camp program, conference programs and other specialty programs, was the original impetus for building a ropes course before ropes courses were ubiquitous in children's camping. "Some firefighters suggested that we get the children into a harness and raise them onto a ropes course. This allowed the campers to feel an amazing sense of accomplishment, resulting in increased self-confidence. The benefits were great and that is what made me really push with our board of directors to plant the permanent ropes course challenge here," says Nancy Oken Nighbert. In 1967, Nighbert's father, Stan Oken, leased a site near Sequoia National Park called River Way Ranch. Oken partnered with two fellow coaches with the purpose of creating a traditional children's summer camp. Since development possibilities were limited on that site, Oken found the perfect spot on the other side of Sequoia at Wonder Valley. Wonder Valley was being operated as a guest ranch so there was a lot of work to be done to convert it into a workable traditional camp. During this transition, Nighbert began working at the camp. And perhaps the most "typical" part of this story is that Nighbert was previously a camper, a CIT, and headed up various departments before becoming a second-generation staff person and eventually an owner. In 1972, River Way partnered with Cathy Rigby, who was fresh from Olympic gymnast stardom, and signed her to run a gymnastics camp. Nighbert says they first approached Rigby's manager, who gave an unequivocal "no" to the proposition. But when they spoke with Rigby directly she was eager to sign on since one of her dreams was to run her own gymnastics camp. "We ran double meals and finagled things so that we could run River Way's full program in conjunction with the Rigby Gym Camp. We brought in big teepees, so we were pretty rustic at first," recalls Nighbert. The gymnastics camp brought increased media attention and hundreds of extra campers to spread the word about the benefits of the summer camp experience. It would also provide the invaluable experience of running an additional program. 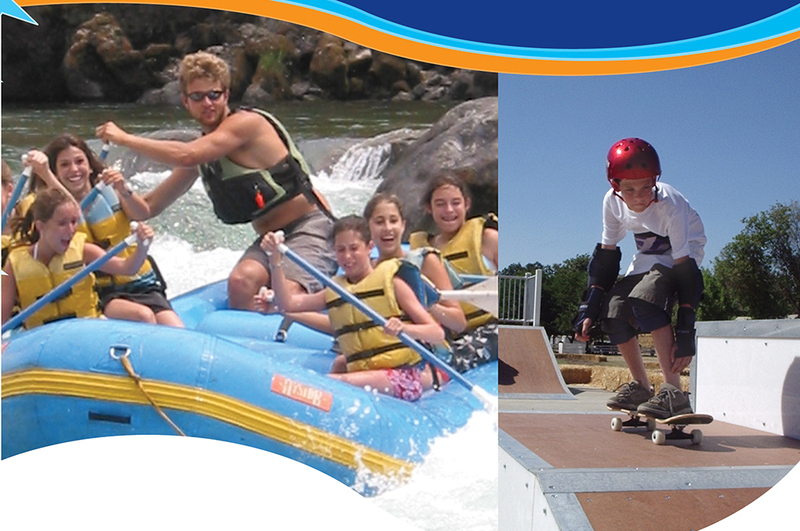 Since that time, River Way has added a plethora of additional camp programs, plus conference- and tourism-type activities. The key to this diversity, says Nighbert, was in developing strong markets while maximizing the camp's strengths. The Oken-Nighbert family has delivered educational programs, which increase a child's self-worth and confidence, using the various camp activities as tools to facilitate such learning. In addition to the resort and conference center component -- called Wonder Valley Resort & Conference Center, which runs from September to June -- River Way also runs the previously-mentioned specialty burn-victims camp, a camp for children with muscular dystrophy, sixth grade outdoor education programs, a reunification camp for foster children and their biological siblings (Camp to Belong) and a family camp. The family camp began specifically for University of Southern California alumni and their families. After 20 years of partnership, USC decided to offer family camp on its own site and River Way continued the family camp concept with Wonder Valley Family Camp. "Next year's family camp sells out at the end of the week, before the guests ever leave. They put down their deposits and sign their friends on a wait list for the following year. There is a huge demand," says Nighbert. "We have infant care, as well as age-appropriate activities for youth, teens, parents and grandparents. A lot of the families are young, and the parents will participate in all of our activities. In the evenings we pull it all together with family-style dining. The counselors promote togetherness, getting to know other people and meeting new friends. The counselor's responsibility is to help create bonds between the families, just like at River Way where the campers want to come back and see their friends again." Every year River Way Ranch Camp develops something new. Nighbert says that aquatics has been one of the camp's recent points of focus. "The campers asked for more water sports -- like water polo, water basketball and water volleyball -- so we put in an aquatic sports center. We also provide classes in water aerobics, synchronized swimming, mommy-and-me swim lessons, water polo and other water sports," reports Nighbert. "This summer we're adding a third pool with four giant water slides. We've been taking our kids off-site to a waterslide park, and now we will have our own." On the waterfront, the camp has an inflatable climbing wall with a water slide on the other side, plus a bevy of big-lake water toys. Wave runners, wake boarding and other water-skiing activities are perennial favorites. "We have camper council once a week where a representative from the cabin group will meet with the camp directors and express the ideas of their cabin group," explains Nighbert. "We'll ask them things like, 'If money was no object what would you want to see at camp?' We follow up with an evaluation we send home, and ask the same questions, in addition to rating the activities." Nighbert says that campers had been requesting a skatepark for three years, so Spohn Ranch built a modular park with half pipes and ramps for the camp that opened last summer. "I went out and looked at skateparks and spent hours watching to see what the injury rate was, and how it's taught. We interviewed instructors until we found people who had the teaching technique. The campers absolutely loved it. That was big during family camp, too, but we have to watch the fathers and make sure they follow the rules," says Nighbert. "The liability issues are no more than they are with wave runners, water skiing -- including jumping and trick skis -- ropes courses, mini bikes and go-carts. So, with everything we do we train our staff a minimum of four days of intensive training in their specialty, plus seven days of general counselor training." In addition to competitive and non-competitive sports, like soccer, softball and basketball, Olympic-type sports are especially popular in the years following the Olympics. So, this summer River Way has added experts in trampoline and tumbling. Outdoor science education is also popular, with activities like rocketry, topomapping and how to read a compass and shelter-building. The key here, says Nighbert, is to educate without sounding like you're educating. "We forced ourselves to learn those activities to meet the state science requirements at their schools, and made that part of River Way as well," says Nighbert. "If you mention the terms academic or science, you may lose your audience, but if you portray it as a shelter-building class, for instance, they want to do that." Going indoors, Nighbert says the camp is in the process of developing an indoor activity center to help accommodate more classrooms and activity areas. At one time, the camp offered a computer component, but quit doing it for about 20 years since it seemed that the kids working indoors really wanted to be outdoors. Computers are back, and now successfully integrated with the camp's outdoor activities. "Now, because the kids can go around with the digital cameras and with our photographers, scheduling a time to take Buddy shots -- while they're doing the ropes course the photographers will get their pictures and take those images into a digital graphics lab. The campers can make mouse pads, t-shirts and many other projects all about their camp experience and take them home," says Nighbert. The digital graphics elements also interact with the camp's music program, where interested campers can cut their own CD, and digitally decorate the newly-minted recording. The diversity of programming and facilities, carefully matched with camper and parent interests, has helped River Way Ranch Camp become one of North America's premier camps.